Nabeel Qureshi Dies at Age 34: "Rest in Peace with the Risen Lord Jesus Christ"
In the last video before his death, Nabeel said he hoped he leaves behind a legacy of love. "As you consider my ministry, I hope it leaves a message of love, of peace, of truth, of caring for one another. Our God is a God of love." 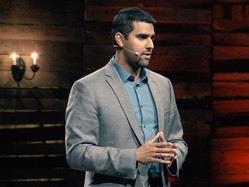 [CBN News] Ex-Muslim turned Christian apologist, Nabeel Qureshi, passed away Saturday after a year-long battle with stomach cancer. Qureshi finally met his match when he attended Old Dominion University in Virginia and met David Wood. He challenged Wood's Christian faith when he saw him reading a Bible by himself. Thus began a two-and-a-half-year period where the pair challenged each other on the doctrines of their faiths. Qureshi published three books, Seeking Allah, Finding Jesus: A Devout Muslim Encounters Christianity, Answering Jihad: A Better Way Forward, and No God but One: Allah or Jesus? A Former Muslim Investigates the evidence for Islam and Christianity.